When it comes to selecting a new wood floor for your home, you will be faced with many decisions. The type of wood — Oak hardwood flooring, Pine floors, etc. — is probably the most important choice, followed by the style of flooring you want. The style you choose will incorporate a number of variables, one of which is the grade. This, in turn, will in many ways determine the final aesthetic of the floor: Will it have knots? Will it have color variation? Or will it be more refined and “clean”? 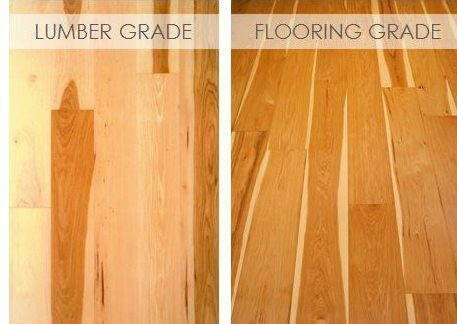 Wood flooring grades can be a confusing matter; after all, there are lumber grades and then there are flooring grades. Flooring manufacturers have their own grading standards, others may also comply with national grading rules, and some flooring styles have no grade at all — antique flooring, for example. Today we will look at some of the terminology, highlight different options and give you some tips to conduct your own research to better understand which grade is best for you. There are several different organizations that have been accredited to write grade rules for the range of lumber species available in today’s marketplace. You may have heard of some of them, such as the Northeastern Lumber Manufacturers Association (NELMA), the Southern Pine Inspection Bureau (SPIB) or the National Hardwood Lumber Association (NHLA). You may have also heard terms like “FAS”, “#1 Common” and “Select”, which are used to designate lumber grades. These grading rules exist to standardize lumber buying practices in multiple markets and regions. It’s worth noting that the grading is done on rough lumber and not on the finished flooring that you will be installing in your home. Grading rules were primarily designed to describe material destined for the furniture and cabinetry markets rather than flooring. Consequently, the intent was to allow for clear boards that would later be cut into shorter, narrower pieces. While this approach works well for many applications, it isn’t ideal for building a wide-plank floor. Consider this example: Imagine you’re shopping for a floor and you’ve decided on a “clear” floor — one with fewer knots. Now, review the flooring panels below featuring #1 Common grade lumber milled into flooring (on the left) and a proprietary flooring-grade (on the right) — both are of Hickory and both are “clear”, but the flooring-grade panel is more aesthetically pleasing, with less color variation and fewer knots for a nice, clean look. You want to make sure that the flooring manufacturer you are working with is not selling you a floor based solely on common lumber grades. You could end up spending a lot of money on a floor that really doesn’t meet your needs. Talk about buyer’s remorse! Many wood flooring manufacturers use standard flooring grade designations, such as those from the National Oak Flooring Manufacturers Association (NOFMA), or the Maple Flooring Manufacturers Association (MFMA). Now, let’s look at an example of a standard flooring-grade compared to a proprietary flooring-grade. The panel on the left is of common NOFMA #2 White Oak. It has plenty of color variation and knots, but also has a lot of natural character you may not want, such as significant grain pattern differences and black mineral streaks. The panel on the right is a proprietary flooring grade. Here, the flooring has been graded to eliminate the some of the grain variation and overly rustic character. Most people would agree the floor on the right is more aesthetically appealing than the one on the left. You may pay a lower square-foot cost for the floor on the left, but you may also have to buy more flooring to sort through on-site in order to achieve your desired look. Plus, your floor is made up of 3-1/4″ wide boards only 2′ long — which translates to a lot more seams and joints and can detract from the overall beauty of the room. Verify with the wood floor manufacturer you are working with if they use one of these standardized flooring grades. If so, your design options for grading and actually creating a wide-plank floor will be very limited; after all, 3-1/4″ is not a wide plank. Lumber is cut from older, more mature timbers and only from the first 40′ of the tree – the oldest and best part of the tree. Older timbers yield wider widths: up to 20″ to yield the widest flooring planks. Older, taller trees offer longer lengths to minimize the number of joints in your floor. Grading for higher heart content in every board creates a more stable floor. Older timbers produce boards of higher quality and less overall character (knots, mineral streaks), so you can customize the grade to get your perfect look, whether you want a casual or formal floor. Carlisle’s proprietary wood flooring grades reflect the aesthetics of the floor, rather than the grade of the lumber. Every board is sawn from the first 40′ of a tree and cut only from mature timbers that have grown in the best climates. Carlisle wood flooring grades ensure the best quality — so you can choose the floor you most love based on the look. There is one category of wood that has no known grading standards — antique lumber. You may find Reclaimed Heart Pine floors available in different grades, but that depends on the manufacturer. This is meant only as a caution to consumers searching for antique floors or reclaimed flooring; do your homework and understand the “risks” if you don’t. 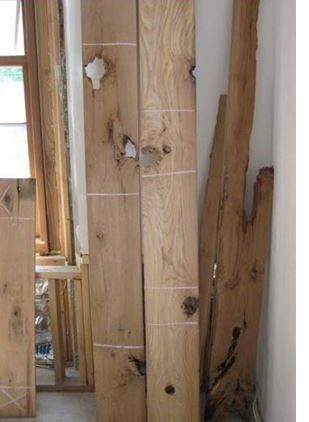 Here’s an example of a potential risk you might face: The adjacent photo was sent to us by an architect who purchased Antique Oak flooring from a new supplier. He was shocked when the wood arrived with large voids, such as mortis and tenon pockets. Some pieces didn’t even resemble boards and many were falling apart. You can see how he then began the laborious process of marking every section that needed to be cut out to produce flooring boards that could actually be installed. In the end, this material was deemed unusable and had to be rejected and sent back to the manufacturer. Before purchasing reclaimed wood flooring, it is very important to understand exactly what you should expect. Request samples and photos of the finished flooring you are considering and understand your waste factor/cutting allowance that you should build in to allow for waste. Also, understand what condition the flooring will be in when it arrives. And lastly, make sure the material is being sawn from reclaimed beams and thick floor joists. In your quest for the perfect wood floor, remember these things: Lumber grades are intended to describe rough lumber and not flooring; most lumber still goes to the furniture and cabinetry markets. Standardized flooring grades may limit your design options significantly while proprietary grades are more aesthetically malleable. The antique wood market is a free-for-all when it comes to grading and it’s critical that you set the right expectations from the beginning to achieve the look you envision. Work closely with your flooring partner to understand their grading standards to ensure the best outcome and ask questions. Looking for a new wood floors? 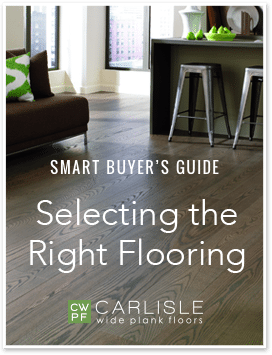 This 20-page guide can help you explore flooring styles and options as you narrow down your favorite floors.